This recipe comes from one of the most unique cookbooks that I own. It is "Cooking With Mickey, Vol. II" and contains the most requested recipes from Walt Disney World and Disneyland. I have to admit that I haven't made most of the recipes in this book, but keep it just for this recipe. It is in no way low-fat, in fact it is high fat, high sugar and really, really yummy! I ended up with this book thanks to my brother. My brother and I have a love affair with everything Disney since we were kids. It was one of our favorite family vacations. I grew up on the west coast of Canada and quite often we would camp our way down the coast from BC to San Diego and back. I was almost 5 the first time we did Disney and I look forward to the day when I can take my kids there too. Jeff (my brother) spotted this book at a Disney store in Seattle about 9 years ago and knew it would be something I would like (especially since it had their cinnimon french toast recipe in it which he loves and knew there was a good chance I would make it for him). 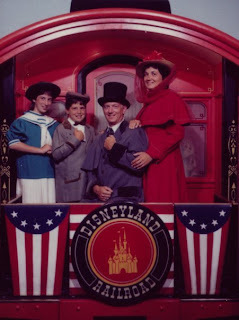 My family at Disney way back (circa. 1989?) I'm about 12 in this picture. Preheat oven to 350*. Sift together flour, salt and baking soda. Set aside. Mix melted butter and sugar until well blended. Add eggs, one at a time, mixing well after each. Add bananas, water and vanilla. Fold in flour mixture and walnuts and blend until all flour is moist. Pour batter evenly into 2 greased loaf pans. Bake for 1 hour or until the centre of the loaf is firm and a toothpick comes out clean. I am always on the lookout for the perfect banana bread. I love the sounds of this one and am definitely going to make it!! My girl friend loves Disney too. I think this cookbook would make a perfect gift. I'll have to try and find one. Thanks! I was in need of a good banana bread recipe! Thanks. I love that it's a disney recipe. My kids will want to eat it even more. Yum, that looks so good with the butter all melted on it :) Banana bread is so yummy warm! I associate banana bread with the school season for some reason. That's right around the corner, so your recipe is right on time. I grew up 30 minutes away from Disneyland! I love it too. This recipe looks great. Anything from Disney has to be good! I have that same cookbook.. I love the shot with the butter on the bread, just how I would eat it, total yum. I want that slice at the bottom all nicely buttered and ready to be gobbled up. I live in the land of Mickey! Yup, just outside of Orlando, FL! Ah ha! I am just back from the grocers with ... guess what...yep...ripe or overripe rather, bananas. And I am on the hunt for yet another banana bread recipe. This looks good. If I can get myself up from the computer...I might just try this today. Good one! 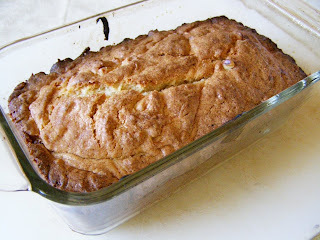 I love banana bread but I've never made it! Your recipe sounds delicious, I like the idea of the vanilla extract! 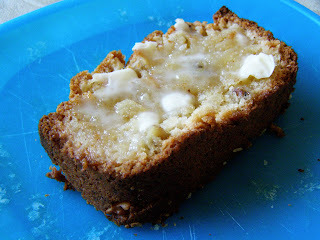 I am always wanting to try new banana bread recipes - this looks so tasty. I'm lovin all that butter in the bread recipe, it already sounds good to me!